12.5" RCOS @ ~f/9 (2880 mm fl) 0.64 arcsec / pixel. The Zoomify image scale is 1.41 to 3.39 arcsec / pixel. Click here for narrow band color mapped images. CCDSoft, CCDStack, Photoshop CS and Noel Carboni's actions. eXcalibrator for (b-v), (v-r) color balancing, using 6 stars from the NOMAD1 database. CCDStack to calibrate, register, normalize, data reject, combine the sub exposures and create the color image. 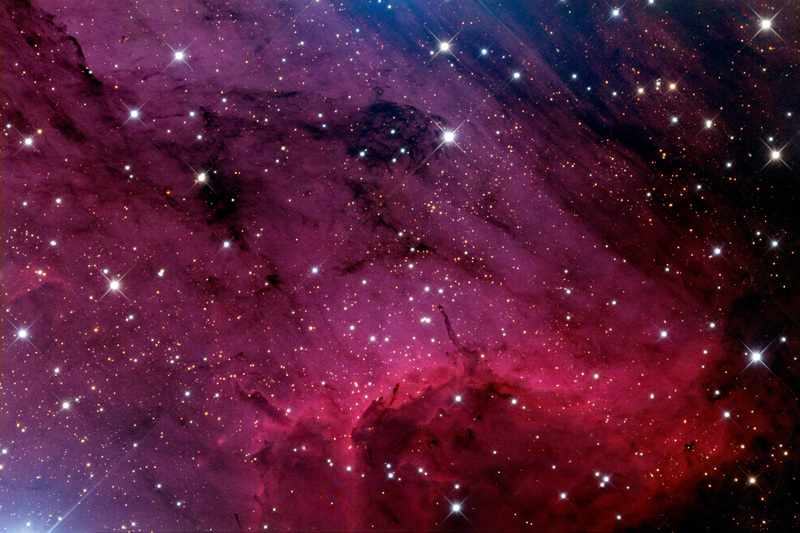 IC 5067 is the elephant trunk region of the Pelican Nebula, which also includes IC 5070. This HII region is located in the Cygnus constellation, at a distance of about 2,000 light-years. This RGB image is an approximation of human vision. The overall red color is due to the dominance of ionized hydrogen gas.